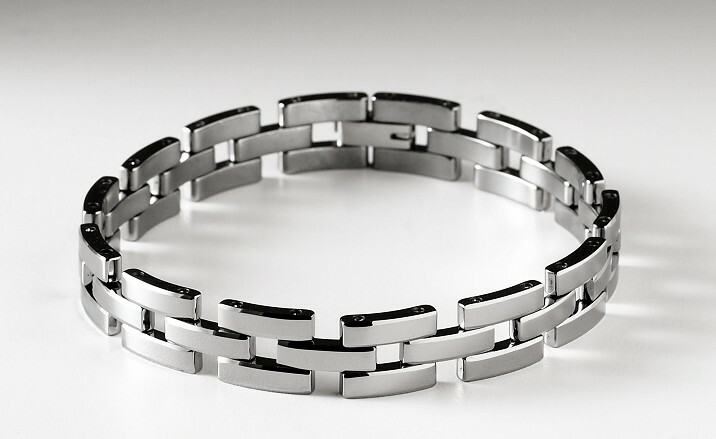 Our Altela Tungsten Carbide Bracelet with squared links is very masculine, clean and stylish. One of our top selling Men's Tungsten Bracelet is this one for good reason. The links can be removed at a local store for a perfect fit. The clasp is very high quality and durable, so no need to worry about having this lost during outdoor activities. As always, we offer a 30 day money back guarantee and free shipping! Q: What is the length on the bracelet? Q: How long is it and does it come with extra links? Very Masculine and great weight, will order more styles when they become available. Nice! Very heavy and masculine. Just like me (without the heavy part!) Thanks again guys! Extremely stylist, masculine and nicely polished. Lots of admirers and compliments. Customer service is impeccable. This was bold and well crafted bracelet. Classic but with definite swagger.